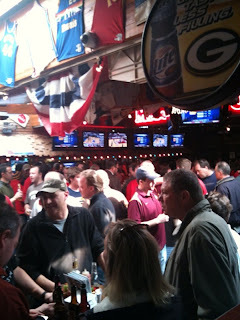 This was the view this morning, Friday at Major Goolsby's in Downtown Milwaukee. It was packed! My co-worker and I were working out of the DJ booth with ticket pick up orders and selling a few last minute seats to customers. Session two is tonight at 6:15 pm and then on Sunday is session three at the Bradley Center in Downtown Milwaukee. We still have some tickets available for sessions two and three. If your still looking for NCAA Men's Basketball Tournament tickets, Ticket King in Milwaukee will be open tomorrow, saturday, from 9am until 1pm and out of the DJ booth at Major Goolsbys Saturday and Sunday. MARCH MADNESS IN MILWAUKEE HAS OFFICIALLY BEGUN!